The new fuel-efficient and eco-friendly 9.9-hp model is likely to be competitive in a big segment of the boating market. A new propane-fueled Lehr 9.9 outboard motor will debut this week at the Fort Lauderdale International Boat Show and reach the market in January, 2013, according to company president Capt. Bernardo Herzer, who just called me from California after completing a 40-mile, round-trip blast from Long Beach to Catalina and back in a 12-foot Lund boat powered by the Lehr 9.9 motor. The Lehr 9.9 during a test run in Southern California. The new twin-cylinder 9.9-horsepower model will be offered alongside the single-cylinder 2.5- and 5.5-horsepower Lehr motors that were introduced in 2012 and won an Innovation Award at the Miami International Boat Show and the Green Product of the Year Award from West Marine. The 9.9 will take Lehr into a much larger market segment at a very popular power rating. The 212-cc four-stroke motor features F-N-R shifting and weighs 87.7 pounds in its lightest version, about five pounds more than a Mercury 9.9 FourStroke. It will be offered in both 15-inch and 20-inch lengths, with tiller or remote steering and optional electric starting. Pricing will start at $2,599. Unlike the Lehr 2.5 and 5.0 models, the new Lehr 9.9 will not have a provision to be fueled from a one-pound “camp stove” propane canister mounted on the motor. At this horsepower rating that small fuel supply would be impractical. 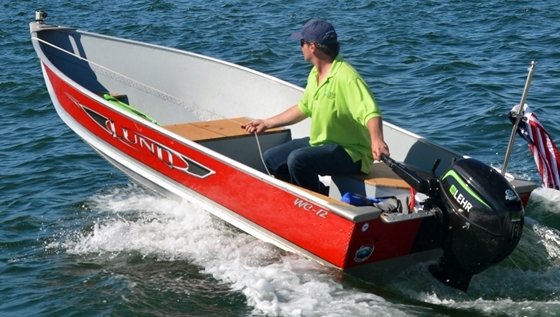 The Lehr 9.9 will be fueled by a 10- or 20-pound portable cylinder carried in the boat, which will be sold separately. A steel tank like those used for backyard grills will work, but Lehr dealers will sell private-labeled see-through composite tanks manufactured by Lite Cylinder that are lighter than steel, non-corrosive, and probably a better choice for marine use. 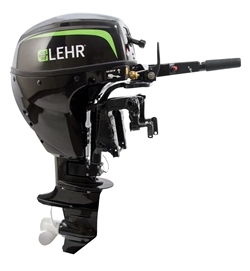 The new propane-powered Lehr 9.9 is similar in size and weight to a gasoline-powered outboard. According to Lehr, the 9.9 model burns 0.44 gallons per hour at a 3,000-rpm cruise speed, and at that rate would operate for 10 hours on a 10-pound fuel cylinder. Herzer says the new motor was designed by the Lehr engineering staff, and will be assembled in China with components sourced around the world. A key component is a patented fuel-metering system that replaces the carburetor or fuel injection found on a gasoline-powered outboard. Because the propane is delivered under pressure, Lehr says owners can expect easy starting in hot or cold conditions. Derived mostly from natural gas, propane is currently cheaper than gasoline in some markets when purchased in bulk. Propane is clean-burning, non-toxic, produces no evaporative emissions, and will not damage marine life. It’s also much cleaner and perhaps safer to have on board than gasoline for auxiliary power, a reason Lehr says its 2.5 and 5.0 models are attractive to sailboat and trawler owners who need auxiliary power, would rather not have gasoline on board, and may already carry propane as cooking fuel. Herzer says the Lehr 9.9 will be sold through West Marine and other marine specialty retailers, and through independent marine dealers.